Hi, it’s Mari. How have you been? I’ve been good. Busy. My days have been filled working on my next book, doing some side projects to pay the bills, scheduling my next three book tours, plus I’ve been dabbling a bit in animal rescue. To be specific, I’ve been trapping/fixing/releasing (and feeding) some cats that were abandoned by their guardians in a house in my neighborhood (nice, huh?). If you know me at all, you know that I love me some animals, so this probably isn’t a surprise. Even so, it’s kind of turned my world upside down. I intend to write more about this someday, suffice to say that helping others can be pretty overwhelming. And no matter how many you help, there will always be more. I’ve noticed that some of the other volunteers seem to have contempt for those who don’t want to get involved, but I don’t share their views. I can see the appeal of shutting one’s eyes and pretending there’s not a problem, la la la. Once you’ve opened your heart a little bit to those in need, so many more come flooding in. I’ve lost a lot of sleep in these last couple of weeks, but I can’t go back. My heart has been opened, for better or for worse. There’s no stopping it now. But enough of all that. Let me tell you about some comics. 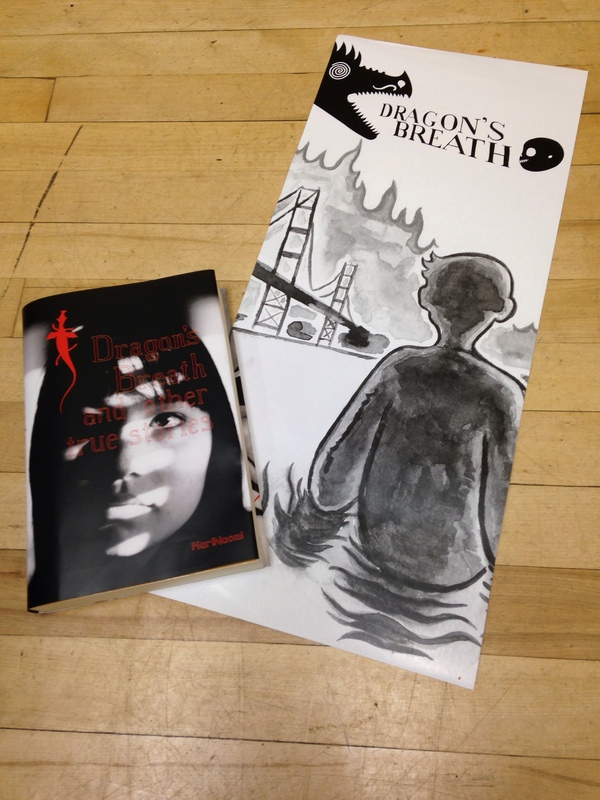 My publisher is now taking pre-orders for Dragon’s Breath and Other True Stories (coming out this September), and they also have a special bundle that includes a signed/numbered dust jacket/poster (limit: 100), designed by Raighne Hogan, plus my zine Said While Talking. The dust jacket is really lovely, despite the fact that my likeness is plastered all over it. More details can be found here. Pre-order the book without the dust jacket/poster and zine here. 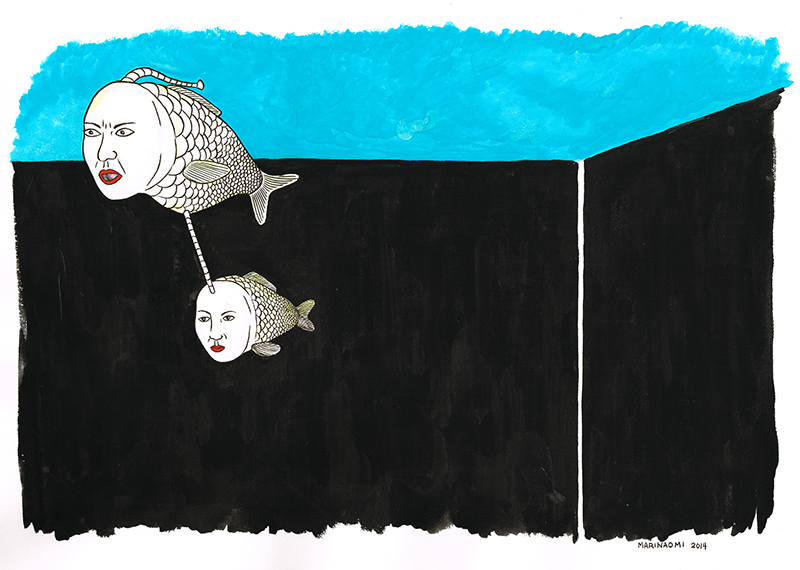 They’ve also started releasing my 2015 graphic memoir, Turning Japanese, on the internet! In my second attempt at animation, I spent hours and hours and hours and hours (this stuff takes a long time!) putting together a video of my short (true) story, “What’s New, Pussycat?” This video also serves as a book trailer for my upcoming book, Dragon’s Breath and Other True Stories. Please take a look. I worked really hard at it, and I think it looks nice. Watch it here. Here’s a painting I made, an ode to Seaman, which is a Sega Dreamcast video game I was intimately involved in the making of. This painting (or maybe the ink drawing version of it, I’m not sure yet) will be for sale at Giant Robot in Los Angeles in their Video Game Art Show exhibit. If you follow me on Twitter, Tumblr, Instagram, or if you “like” my Facebook art page, you might have noticed me live-tweeting (for want of a better word) the creation of my next graphic novel. To see all the posts I’ve made so far, you can search Instagram or Tumblr under the hashtag #LosingtheGirlGN. Or just follow this link. I’ve also been doing some illustrated reviews for the LA Review of Books. I participated in a blog tour, where I answered a few generic questions. This might be interesting to you if you care at all about artistic process. I enjoyed doing it because it gave me the opportunity to gush about my hero and friend, Rob Kirby. Read it here. This Friday I’m doing a reading at Quimby’s in Chicago, with Elisha Lim and Mike Dawson. Over the weekend at CAKE, from 2 to 4 each day, I’ll be signing books at the 2D Cloud table. During my signings, my publisher will be GIVING AWAY readers’ copies of my upcoming book, with the purchase of my zine and a dust jacket (see photo above). But there are ONLY TEN COPIES, so it’s first come, first serve! Next week, my video game art (see above) will be featured in a show at Giant Robot in Los Angeles. The week after that, I’ll be on a panel at the Mixed Remix Festival, at the Japanese American Museum in Los Angeles. This Fall, I will be touring the East Coast, SF Bay Area, and the Pacific Northwest. All event details can be found on my website. Thanks so much for reading. Feel free to drop me an email or post a comment and let me know how you’re doing. I’d love to hear from you. I was tagged by Rob Kirby to participate in a “writing process” blog tour. Before I start answering any questions, let me tell you about Rob Kirby. Rob is a cartoonist, a reviewer of comics, and the prolific editor of myriad anthologies. Before I ever even considered drawing comics, I used to read his “Curbside” autobio strip in the funny papers (this was probably in the mid-nineties). I grew attached to his sensitive, quirky characters drawn with a loose, vibrant line. His work made me want to be a gay boy in NYC. Many years later (2006 or so?) I saw him speak on a panel, and I completely fan-girled out on him afterwards. Not only was he gracious and not scared off, but he started corresponding with me by email, and I discovered that he’s kind, witty, inclusive, and one of the nicest people I’ve ever come across. Today he is one of my closest comics buddies. And even though I consider him a friend, I still have the occasional moment of fan-girl freak-out (Sorry, Rob!). Like when he says something nice about my work, or when he sends me doodles of his adorable dog, Ginger. I feel so lucky. How many people get to meet their heroes, only to find out that in real life they’re actually superheroes? When I’m not working on promotions or other side jobs (LARB), I’ve been slogging away at my next project, which is a deviation from all the memoir I’ve been writing. I’m not saying a lot about it just yet, but I can say that it’s a fictional piece that involves a mystery about aliens. I should be done with it in, oh, about forty years. (Kind of joking.) It’s a good thing people live a long time in my family. One of the great things about working in the comics medium is that there is so much territory that hasn’t been explored. So unless a cartoonist is biting the style of another, chances are that they’re doing something that has never been done. With that said, it’s incredibly difficult for me to talk about the uniqueness of my own work. My hero Rob Kirby, however, once called me a “master of minimalism,” and that made me very happy. My first book (Kiss & Tell: A Romantic Resume, Ages 0 to 22 ) was about me figuring out my issues with commitment and love. The next book (Dragon’s Breath and Other True Stories) was inspired by the writing of Cheryl Strayed as the advice columnist Dear Sugar. Her work on the Rumpus moved me to dig deep into my emotions and tackle difficult truths. My book next year, Turning Japanese, was more about an interesting experience I had than any sort of catharsis. I thought a book about Japanese hostess bars and exploring a cultural identity would be interesting to people. The book I’m working on now was originally started as a way to work through my issues of betrayal with a former friend. Through fiction, I was trying to look through her eyes. But then aliens got involved and it turned into something else. 2: I jot down ideas and sketch out what they might look like. 5: …which turns into a full-blown script. 6: I make a bunch of revisions to this script, often with the help of others (e.g., my agent, my husband, my writer friends). 7: When the script is as polished as it can be, I thumbnail each page. 8: Using the thumbnails as guidance, I pencil out all the pages at their final size using graph paper (graph paper is especially helpful for lettering). 9: I scan and enlarge each page to as large as will fit on a 8.5×10 piece of copy paper. 10: I print out the scans. 11: Using a light box, I ink the comics onto nice paper. I know it sounds like a lot of steps, but ultimately it saves me a lot of work. Drawing takes an excruciating amount of time, so I take measures to ensure I don’t have to do a lot of redrawing. Also, penciling on a different sheet of paper than the final removes some of the anxiety I used to have about ruining a precious page. If I spill tea on a final page, I can just go back and re-ink it without having to also pencil the whole thing again. Or if I crumple up a penciled page, it doesn’t really matter, since that won’t be the final anyway. Recently my friend Lisa came over and was nervous drinking coffee near a stack of my work in progress. I noticed this and had a little fun with her by grabbing one of the penciled pages and crumpling it up. The horrified expression on her face was just fantastic. Okay, that’s it for my Q&A. Here are the folks I’m tagging: Yumi Sakugawa (http://acrosstheyumiverse.tumblr.com/), Myriam Gurba (http://lesbrain.wordpress.com/) and Melinda Boyce (http://www.melindaboyce.com/). Book trailer for the graphic memoir collection, Dragon’s Breath and Other True Stories, published by 2D Cloud/Uncivilized Books, Fall 2014.